Europe a la fin du V.me Siecle. 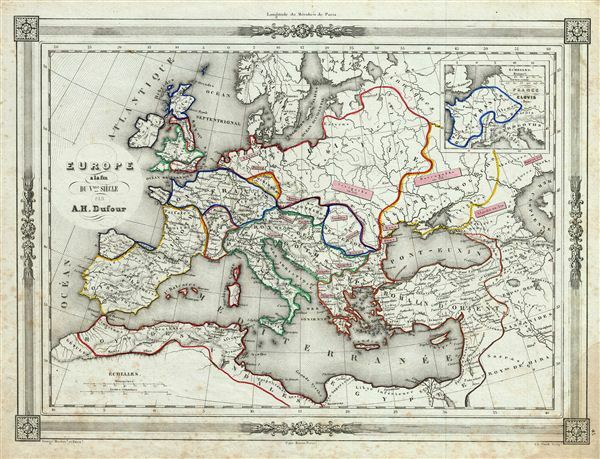 An uncommon and extremely attractive 1852 map of europe at the end of the fifth Century. The map covers from modern day United Kingdom to Russia, and south to include part of egypt, and the Barbary Coast. The map includes parts of what are today Turkey, Russia and Syria. An inset on the top right corner details France under the rule of Clovis, c.510. Throughout, the map identifies various cities, towns, rivers and assortment of additional topographical details. The map depicts europe after the so-called Barbarian Invasions, which saw the Western Roman empire fall to Ostrogoths, Visigoths, Goths, Vandals, Saxons and much of central and northern europe under the sway of Attila and his merry Huns. Historians now also use the term 'Barbarian Invasions' to refer to the simultaneous and more peaceable migration of Germanic peoples westward, including the first Anglo-Saxon settlement of Britain, when, for all intents and purposes, the Roman empire had ceased to exist. The map features a beautiful frame style border. Prepared by A. H. Dufour for publication as plate no. 43 in Maison Basset's 1852 edition of Atlas Illustre Destine a l'enseignement de la Geographie elementaire.